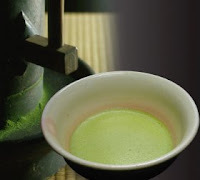 A Thought Shared ....: How to Brew a Cup of Green Tea, and more..
Use one tea bag, or 2 - 4 grams of tea per cup (one to two teaspoons, depending on the variety of green tea you are brewing). Fill a kettle with cold water and bring to a boil. After unplugging the kettle, allow it to stand for up to 3 minutes. Pour the heated water over the tea bag or tea, and allow it to steep for up to 3 minutes. If using a tea bag, remove the bag. Allow the tea to cool for three more minutes. OK, so now you know how to do it. Let us move on to why you should do it. Red wine contains an anti-oxidant called resveratrol, a polyphenol that limits the negative effects of smoking and a fatty diet. The French and Spanish like their red wine, and it has served them well. There is far less incidence of health problems related to an over-rich diet in France, the home of over-rich food, than there is in the USA. Smoking is almost a national pastime in France, Spain and Japan, and yet the health related problems in these countries are substantially lower than almost anywhere else. There are a few web sites that cover the above topic. I will leave you to draw your own conclusions. I will say this though. Of all the places I have travelled, I have seen less amounts of obviously infirm people in France or Spain than I have seen anywhere else. I have not travelled the Orient, so do not have first-hand experience of the area, but I understand that people there live to be older and healthier a whole lot more than in other parts of the world.